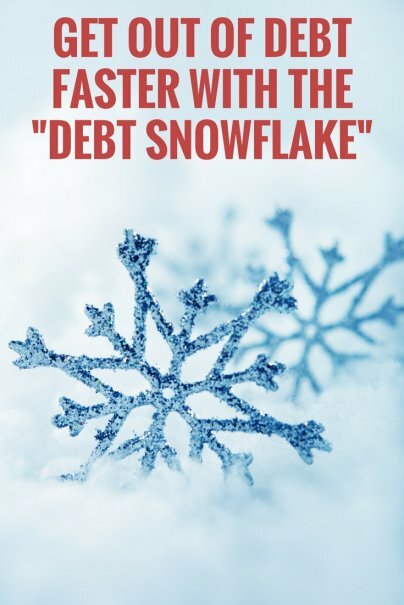 Get Out of Debt Faster With the "Debt Snowflake"
Home » Personal Finance » Debt Management » Get Out of Debt Faster With the "Debt Snowflake"
Credit card debt can be very dangerous. With revolving balances and double-digit interest rates, your debt can quickly balloon out of control. There are several strategies experts recommend for paying off debt, including the debt avalanche and debt snowball methods. With the debt avalanche approach, you prioritize paying off the card with the highest APR, saving you interest charges in the long run. With the debt snowball method, you focus on paying off the smallest debts first, racking up small wins quickly that can give you the motivation to stick with your debt payoff plan. Both methods rely on budgeting money every month for minimum payments on some debts, plus extra money to throw at the debt you're prioritizing. But what if you feel there is no money in your budget to set aside for these payments? That's where the snowflake method comes in. It doesn't replace the avalanche or snowball methods, but rather is a way to find the money you need for either approach. Instead of worrying about how to come up with large lump sum payments for your debts, you look for ways to shave money off your everyday spending or earn a little extra pocket change. You then use that "found money" to make very small, frequent payments on your credit card accounts. While the amounts may seem microscopic compared to your overall debt balance, over time, the little payments add up and knock off months from your repayment term, saving you hundreds of dollars. Debt snowflake is a method that you can use in combination with other repayment methods. Whether you decide to tackle your highest interest debt first, or the debt with the lowest balance, using the snowflake approach can help you find money to pay down the debt. With the debt snowflake, you apply everyday savings directly to your debt right away. For example, let's say your weekly grocery budget is $50. But thanks to coupons, you only spent $46 this week. If you follow the debt snowflake approach, you will take that surplus and make a $4 payment on your credit card balance. You do this for every circumstance where you save a little money. If you normally spend $60 at the salon for a haircut, but you go to Hair Cuttery or Great Clips instead for $25, you would put that extra $35 toward your debt as soon as you get home. Little savings can add up quickly. If you swap out one restaurant lunch a week for a bagged lunch, carpool with coworkers, use coupons, or just go without, you can find a little extra change in your budget that can go toward your debt balance. When facing a mountain of debt, the idea that an extra $4 or $5 here and there could make a difference may seem ludicrous. But those little snowflake payments can have a big impact. For example, say you have a credit card balance of $3,000 and with an APR of 15 percent. If your minimum payment is $100, it would take you 38 months to pay off the balance and you would pay $784 in interest. If you applied the debt snowflake approach, you could cut the repayment term and interest charges. Let's say you clipped coupons and shopped for deals at the grocery store, and were able to save $4 a week. If you applied that extra $16 a month to your debt payments, your repayment term would be just 32 months and you'd pay just $647 in interest. Applying your small savings each month gets you out of debt a full six months earlier! And if you look for additional savings and apply small windfalls (like gifts or a bonus from work) to your debt, your snowflakes can accumulate that much faster.